Looking for the best coffee mug for travel? For commuting? The Starbucks Click and Sip Travel mug may be it. Is the Starbucks “Clip and Sip” (Starbucks Clip Tumbler) double-walled stainless steel coffee mug worth the price? Let’s face it, the main buying “feature” on this 16oz. Clip&Sip travel mug is the “clip” that allows you to open up the handle like a carabiner, insert it through a strap or luggage handle, and then “click it” securely in place. Still, nothing is worse than trying to get into your car with a bag, carrying a schedule or books, and a mug only to turn the key in the door and pour coffee all over yourself, or your stuff. Or rushing through the airport and have your mug spill on your shirt or slacks, either due to shaking or the lid not truly sealing. Or trying to dribble a basketball and make a shot without spilling your joe. So we tested this Starbucks mug and it’s lid/seal, because a coffee mug is only as good as it’s ability to get the coffee in your mouth and stay off your clothes/luggage. The “clip” or buckle on this mug is as classy as the mug itself, but you can buy a cheap carabiner and do the same thing with any travel mug for $1.50…so how does this mug measure up? Due to the price, $22.95, at Starbucks (or cheaper if you get it discounted as I did) it is on the expensive side for a travel mug. (Maybe has some built-in caché for an executive or frequent traveler?) and a Starbucks location may still be the best place to find it, but it appear that the Starbucks store online has a new version and is no longer selling this particular mug, (The new version is called the Stainless Steel Clip Tumbler, under their travel mug line) so you might want to check resellers or Amazon, or even eBay. Not long ago they also were selling a bright orange version of the original Clip and Sip (I noticed that some stores here in Phoenix are still selling them but they may be remainders, until they sell out). For the price, it appears well-made, out of quality materials, with no rivet or screw points or visible seams. It appear that the latest version now on sale has a “fixed” rigid handle and a carabiner type spring clip. 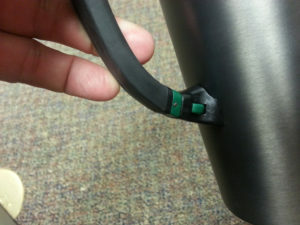 While the handle and clip are both larger, by being “fixed” it may be harder to clear and clip or unclip onto luggage handles, etc. Let us know your opinion if you purchase and use one while commuting/traveling. The rubberized, flexible handle has another advantage. It makes the mug much “grippier” than a regular travel mug. Not sticky, but grippy. And big hands can fit (unbuckled) if they can’t find handles to fit their hands. Especially good in cold climates if you might wear thick gloves at times! The bottom of the mug is rubberized and slip-proof and unlike some mugs, this one has a nice balance that should keep it upright, even on long, bumpy flights, or while in your car or taxi. Interestingly enough, the instructions inside the mug clearly state it is not intended to be spill-proof or leak-proof. I guess they are now protected against consumer complaints. However, after 30 minutes of piping hot coffee with milk being in the mug, we tilted it, shook it, even simulated running through an airport and no leakage occurred. We then opened the mug, “took a drink,” shut it, and started shaking it again. Still, I could never get this mug to leak. even turning it completely upside down and shaking it as hard as possible. I trust this mug clipped sideways, full of coffee, on the run, on my bag. Your mileage may vary. 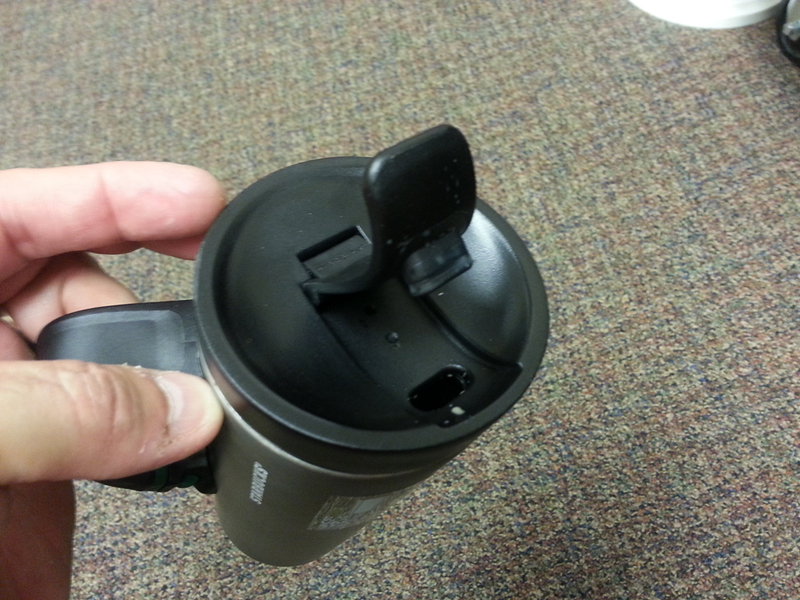 Note: Like most travel mugs, you shouldn’t run it through the dishwasher, but rather wash it by hand to guarantee the seals and plastic remains watertight. That also brings up a concern trying to get the lid off…it’s only a matter of time until the flap cover snaps off trying to get a grip to crank the lid off which can get really tight due to the vacuum. But it does seem to be good at keeping drinks hot for at least a 6-8 hour day. Maybe just warm after that. I am amazed about how well this double-walled, vacuum-sealed mug maintains heat. Even when frequently opening it to drink (ANY THERMOS CAN STAY HOT IF IT’S NEVER OPENED.) The heat doesn’t seem to transfer through to one’s hands however, which is a good thing. It appears that there are different versions of the Starbucks Clip and Sip. 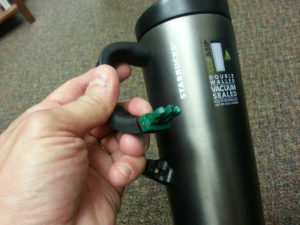 Mine has a black rubber handle and dark Starbucks brand green clip (See the video), while the newer versions on Starbucks’ site appears to have a bright green rubber handle and clip. Personally, I think mine looks classier. UPDATE 2/2017: Rich let me know that this style Clip and Sip is no longer being sold by Starbucks and the link was broken. I updated the link to reflect the entire Travel mug line by Starbucks so you can see the new version as well as the older Clip and Sip if they begin to sell it again in the future. After two years the finish (especially around the top) begins to flake off and dropping the mug accidentally, can definitely snap off the handle (at the top where it attaches to the stainless steel). This has now happened to me twice. UPDATE 1/2015: It appears that my style/color “Clip-and-Sip” is available again at the Starbucks store. I updated the link above. UPDATE 1/2015: I accidentally broke my lid flap trying to leverage the cup open. Dang if it’s not one tight lid! Well, I wrote the Starbucks store online asking if there was anything they could do (acknowledging my fault), and if they could ship out a new lid. (It still seals, but comes off in your hand – So is easily lost, and I’m not sure it could handle running through an airport without being lost) – Well, they got right back to me over the holidays. No extra lids / replacement parts are available for free, or for purchase. BUT, they did apologize and mentioned if I was within 60 days or purchase (and could find my receipt) I could exchange it (couldn’t find that receipt). They also credited $10 to my account towards the purchase of a new one (half the price)! I have already ordered a new one from the link above. The other I’ll just have to use around the house and try not to forget where I leave it/clip it! So, I’d say ***** stars for Starbucks for promptness, awesome customer service and understanding. I wish every corporation empowered their employees to make more customers happy. Really great looking, with innovative handle and dark stainless finish. Gets the job done. Spill-proof and stays hot for a long time. Did we mention how it looks and works? Good for water on the flight when you don’t want to carry a water bottle as well as your mug. The price. I think this mug is expensive, but a great travel mug. May be hard to find. Especially now that a new version is being sold. The lid is shallow so that the hinge of the cover hits your nose when you take a swallow but don’t lean your head back enough. If you drop it on concrete, the handle has a real chance of snapping off. A note: I have not had any of the leakage issues some claim to have had. (Maybe they didn’t screw the lid on tight enough?) As you can see from the video, I put it to the test. Plus carrying it everyday. Haven’t seen a drop leak. The newer, brighter green rubber and clip looks cheap to me. 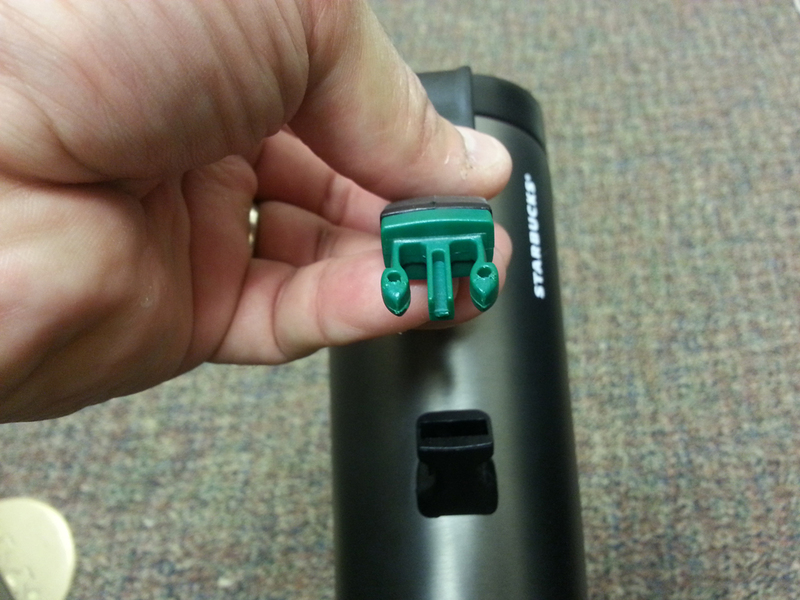 I prefer the black rubber handle and dark green clip personally (like the photos above). The newer bright orange travel mug is good for those wh don’t like the subdued black and steel. May have some issues at airports due to metal. Drink it, rinse it out, clip it to the bag at the TSA security check, refill on other side. If you can find it, and it appeals to you (with the handle clip), then rest assured, this mug will do the job and I highly recommend it. Having only had it about a month and a half now (and carrying it daily, being semi-careful), I can’t say how long the finish will look nice, but it still looks new. Of course, stainless steel does allow you to use a very fine sandpaper to “polish” out nicks and scratches (Follow the grain when trying this!!! Stainless steel is like wood.) when it starts looking shabby. However, this mug has a dark color for stainless steel so it may have a finish on it to achieve that look. But so far, banging and clanging around commuting, it has held up very nicely. However, expect the “varnish” or film protecting the stainless steel on the outside to begin to wear off (esp. around the rim) after a couple years even if using the dishwasher and a non-scratch scrubbing pad. 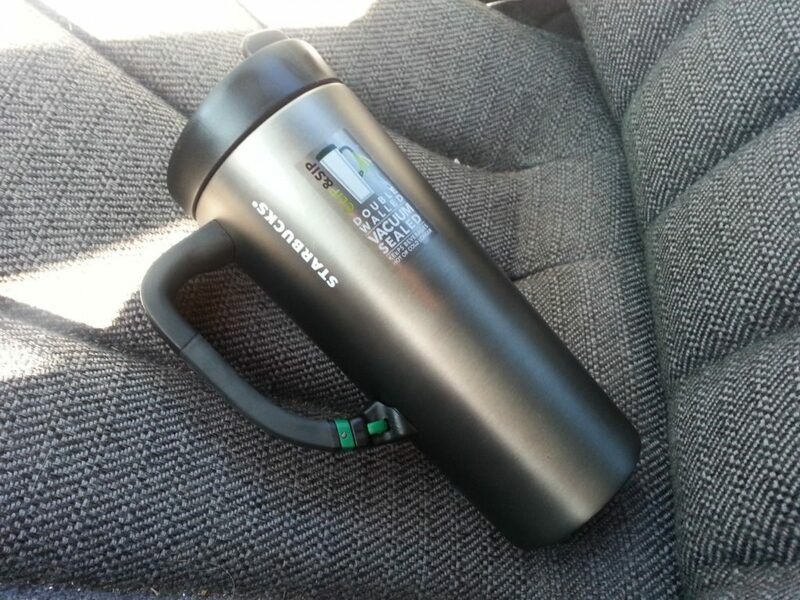 Starbucks Clip-and-Sip Travel Mug: ***** Stars for appearance, functionality, and design.